ND: In your notice of withdrawal, you accused the party of not following procedure. Could you please explain? JM: One of my concerns is the uncertainty around the procedures for the primary elections. It is said any member with a particular plastic card was allowed to vote. The problem arose that it’s not certain who is supposed to vote for an aspiring candidate. The party has not indicated how it will ensure that only people in a particular area will vote. We had people bussed into Harare West to shore up support in the constituency for a particular aspiring candidate. The communication has not been that good. I fear that if people can be bussed for a constituency meeting, this is likely to recur during the primaries. Harare West has people who traditionally do not participate in party activities, but will vote in the elections proper and there has not been much communication to the people. I have, as a sitting MP, been working in Zanu PF strongholds, which time I should have invested in Harare West. The people here needed time to be converted to invest their time in the internal party processes. I was in Mt Darwin and recently in Zaka mobilising support for the party, but all of a sudden, the party decided all constituencies were going to be contested and there is no time to talk to people. I am sure the party could have done better. It is unfair to have asked us to go out and shore up support in other constituencies, and while out, there would be contestants campaigning in our areas. We have been all over the place, but are now expected to be contested. There was also a change of the kind of card that is supposed to be used after people used their money to paper cards only accessible to a select few. ND: Did former President Morgan Tsvangirai promise to protect sitting MPs? JM: Precisely, that is what he said. He summoned the party caucus and told us that it would be a waste of energies for the party to fight over only 34 constituencies that we already hold. So we were asked to go out and shore up support in areas deemed to be Zanu PF strongholds to help the incoming candidates garner support. Even the current president (Nelson Chamisa), early in his tenure, he said the same and sent us out to campaign in other areas that are considered. So I realised now that I do not have the time. 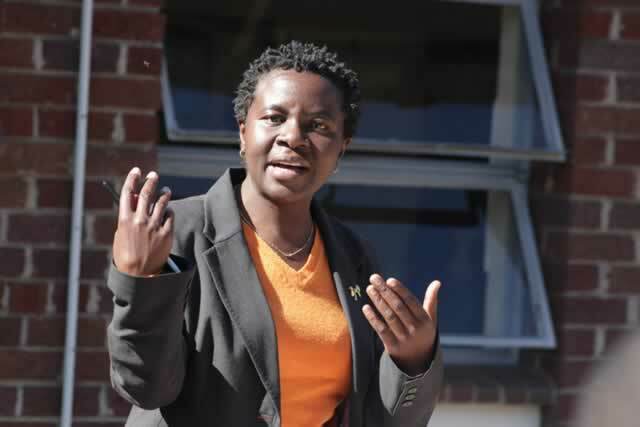 As a middle-class constituency, Harare West would need time to explain to its people that they are supposed to participate actively in party processes. Now we are just weeks before an election and it is impossible to do that. ND: There are reports that your problems stem from an unwillingness to accept Chamisa as party leader following Tsvangirai’s death. How true is this? JM: That is news to me. I would be happy to get details from the people who are bringing this narrative. I strangely don’t know where my problems are coming from and I am willing to know. I am a member of the national executive and he (Chamisa) is my president. I am a human rights lawyer and defender, so I respect him, first, as a human being and secondly, as the leader of my party. ND: Are you going to stand as an independent? JM: What I have done is to withdraw my candidature from the party primary elections. I have several options, but I am not intending to join anybody. However, as a citizen of Zimbabwe, I am considering and looking at what it is that I want to do. I still want to contribute to Harare West. I just thought I should let things go for now and think clearly about my next move. I will advise my constituents because everything I do is in their behalf. When I make the decision and I will do so before the coming elections, I will communicate this publicly. ND: Have you had access to the register of voters or party membership register for your constituency? JM: No! I haven’t and in my letter to the party secretary-general (Douglas Mwonzora), I argued that there are some people who have access to information regarding the primaries, while others do not have. If there is a voters’ roll that the party has compiled, I would want to see it, so I can approach those people who are eligible to vote and campaign properly. As a potential candidate, I do not have. My opponents have access to the new cards as well as the membership register. I am curious to know when the voters’ roll was compiled. As of Friday, when I decided to withdraw, I did not have this information and I was worried that my opponents had access to it and they would have an unfair advantage. ND: Do you think there is a third hand behind your political problems? JM: I am not sure and I don’t know. I think it’s also important that in terms of the criteria, we are clear to reduce the chances of people feeling cheated. I have five concerns that I raised with the party. The first being the blatant disregard for the criteria for who is a candidate. There is a qualification in terms of the criteria set by the party, only people who have been members of the party for five years can contest. To the best of my knowledge, my major opponent does not meet this criteria. The second is the issue of bending rules in order to accommodate her (Joana Mamombe). Then there is the issue of seniority, which should have worked to my advantage. But to my shock, my seniority has now been used against me. I understand she has written a letter of complaint to the party, arguing that if the seniority criterion is used, it would disadvantage her. I am a member of the national executive and nominated by Mashonaland Central, now I have been told to go to that province, where I actually do not live. ND: Would you say you are scared of competition? JM: I am a member of this party. It has a constitution and very clear rules and procedures for its internal process including primary elections. I abide by rules, but my problem is they have not been followed to the letter and spirit. I must qualify and whoever is competing with me should also qualify in the same way as me. I would be ready to contest anyone who qualifies to contest with me. There is not even competition to talk about because this particular contestant does not qualify to be an aspiring candidate for the party. ND: Do you think there is an inherent problem within the MDC-T of not sticking to procedure or your case is isolated? JM: I haven’t conducted any survey because I am concerned about my constituency. I know there is an utter disregard for rules of how we should conduct elections. I am dealing with my constituency. I would implore the party to deal with these issues and run the elections in a manner that we have set. If we do not want the rules, let’s change them, but let’s follow what we would have set. ND: Has the party responded? JM: I delivered the letter on Friday and have not received any response. I made a decision and my letter was clear. ND: Would you be willing to go back if your concerns are addressed?